I found this note on the snow-covered ground while walking to a Rite Aid store today. I saw the scrap of faded blue paper and the heart icon caught my attention. I almost kept going, but the romantic amateur detective in me felt compelled to bend down, pick up the note and examine it. The brevity and directness of the message made me smile. I assumed by the handwriting that the author was a young female. It could have been a note from a sister to a brother or a girlfriend to her boyfriend. 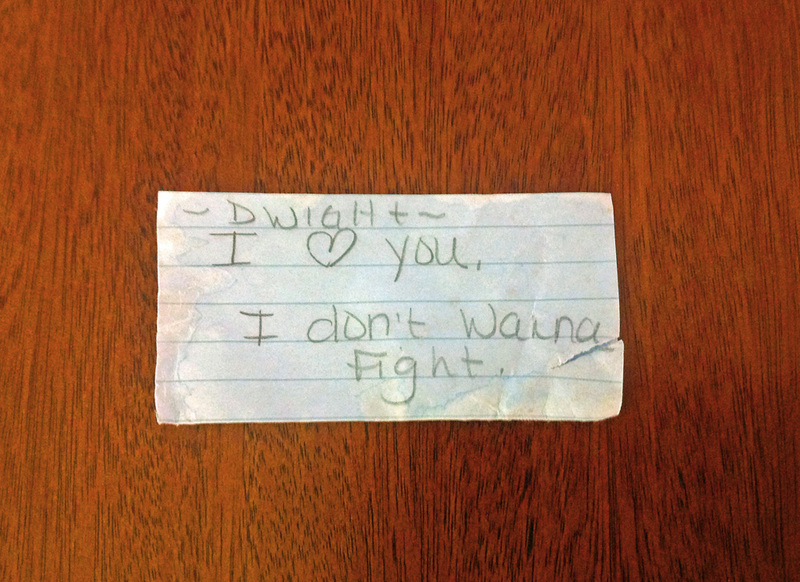 In just seven words, plus one icon, the girl had poured out her feelings to Dwight. She exposed her heart; she made the effort to reconcile. I wondered if Dwight accepted her apology. But since I found the paper on the sidewalk, tossed aside in the snow, I suspected he did not. If that’s the case, I thought, maybe she’s better off without him. Have you read the book “Found?” It’s full of letters and notes and lists… all discovered by others. I love it. Thanks for the suggestion Daeya! Who is the author?